Octopus – Don’t beat it, don’t eat it! There’s been quite the furor recently after a diver was seen last year punching an 80 pound Giant Pacific Octopus at Alki Cove 2 he caught in order to subdue it. He said he wanted to capture it and take it home, “to draw it for this art project, and eat it for meat.” Outrage followed and has continued for the past year. Part of his response is in essence that the octopus was sort of free range, and that a factory farmed octopus would suffer more, saying “He suffered, of course, at the end but not nearly to the extent of factory farming.” This reminds us of the dodge often employed by some consumers of more traditionally eaten free-range meats: “there’s worse.” While there may or may not be worse, there’s definitely better, much better. Don’t eat meat or fish all! The diver goes on to say, “I feel kind of bad every time I kill an animal… That being said, I get over it. It’s life. You know, we’re predators, we eat meat. There’s nothing that’s going to really stop that or change that.” Not surprisingly, we strongly disagree! See our post on the natural diet for our anatomy and physiology to see why. Don’t let the unusual shape of the octopus fool you. They have a brain and a complex nervous system, and they are both intelligent and sensitive. 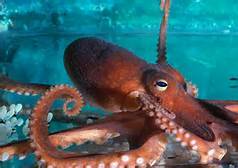 Octopuses have earned “honorary vertebrate” status in the European Union, where they are legally protected against “pain, suffering, distress or lasting harm.” British laws even give special protection to octopuses. So, yes, they are capable of suffering. Now that you know why one shouldn’t beat it, here’s why you shouldn’t eat it either. Almost 25% of its fat is saturated, a serving contains 82mg of cholesterol and 391 mg of sodium, and of course it has no fiber. The local waters do contain some pollutants which seafood is known to bio-concentrate in their flesh. There are much healthier choices. If you still want seafood why not try Sophie’s vegan seafood? It’s both much healthier and way more compassionate. Try ‘em at Vegfest!